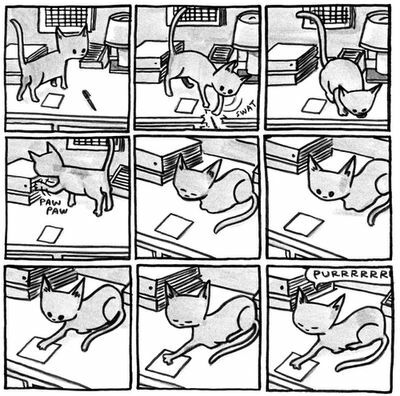 Cats are Weird: and More Observations by Jeffrey Brown. Chronicle Books, 2010. 9780811874809. Sarah: I went to Seattle’s University Bookstore and I bought two or three books that were incredibly serious, thought-provoking, and probably extremely good for me that I still haven’t read. I bought this to balance them out a bit. It’s cat comics. Gene: Do you know Jeffrey Brown? S: I do know him. I really like Lucy & Andy Neanderthal. G: Did you read the Star Wars books he did? The books about Darth Vader as a dad? S: They look really cute. G: Before that, he started the Jedi Academy series for Scholastic, and before THAT he was known for writing about his bad relationships. G: In these little notebook-ey stream of consciousness things. S: I definitely knew him by reputation before he did the kid stuff. G: I love those books. He also did some Transformers parodies for Top Shelf. G: Anyway, I love all of his books. Cats are Weird. It’s a square book. S: And all the comics are square and usually composed in nine square panels. And there’s only so many things about cats you can write about, they’re not that complicated. But he does some nice stuff, off the beaten path, cat-wise. This is not an adorable cat book, this is not is a cats are terrible book, this is a cats behaving in weird catlike ways and sometimes surprising ways book. I like the cartoon on how his two cats got their names. They both have really stupid names. It sounds like a family member called them something and they responded to it, so one is named Buddy and one is named Kitty. G: I like how it goes from cartoony to realistic ink drawings. S: Yeah, his cartoony drawings evoke not just the movement of the cats and their shapes but their expressions. And the really realistic drawings bring you back to the fact that cats are more complicated than that. There’s a wordless comic where a cat is trying to put its paw in running water to get a drink and manages to spray water all over the place and into its own face. I’ve seen that same gag in other formats, but I enjoyed it here. G: I like the weird, small moments, they’re not even very comic strip-like. S: Yeah, they’re not gag strips. It’s just “here are some things that happened.” A cat trying to attack the vacuum cleaner when it’s not on, because when it’s on it’s too scary. G: My cats use their paws like hands. Have your cats done that? S: Yeah, or they try to. G: I’ve never had a cat do that before my current pair. Tokyo will come up to me and touch me to get my attention. He’ll tap me on the hand or arm. Maple has learned to wave her paw, to stand on the back of a chair and wave a raised paw at me. If I get near, but not quite petting her, she’ll “grab” my hand and pull it down toward her head. S: (laughs) I’ve seen that. 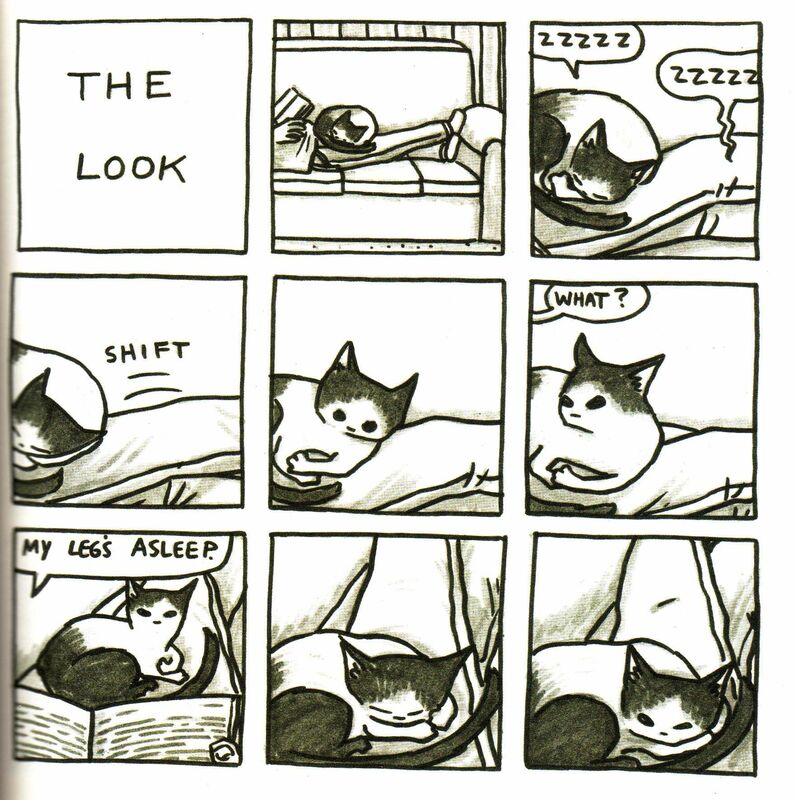 This comic is about The Look, when you dare to move while a cat is sleeping on you. S: I like this one, Life Imitates Cartoons, with the cats zooming in and out of doorways in a hallway. This other comic also brings in the vocabulary of cartoons, in which the dashed line shows where the cat has been. G: Like in The Family Circus when Billy has been running around the yard. What reminds you most of a cat you had? S: Honestly, the ones where they try to eat something that isn’t food and make faces. G: This one is my favorite, this had just happened to me when I first read this. S: The cat is putting its paw over a piece of paper. Title: Resistance is Futile. It’s realistic without being treacly. G: Brown’s cats look a little bit chibi, with big eyes that make them look cute and more kitten-like. I really like his occasional use of color in this book. He doesn’t use color in his comics very often. It looks like he just did ink washes or something.